Get the Price of Top 10 API 5L X42 DSAW Pipe Manufacturers & save upto 25%, stocking all size API 5L X42 DSAW Pipe of Top Manufacturers. Unbeatable price range of API 5L Grade X42 pipe PSL1/2, Grade X42 welded pipe, X42 Boru, distributor & dealer of API 5L X42 High Pressure Steel Pipe, API 5L GR X42 pipe, API 5L PSL2 X42 (HIC & SSC tested), Grade API 5L B X42, API 5L Grade X42 carbon steel pipe, also stock IBR approved API 5L X42 DSAW Pipe, low-temperature API 5L X42 DSAW Pipe & high-temperature corrosion-resistant API 5L X42 DSAW Pipe readily available. Our domestic & international network of sources allows us to supply a widest range of API 5L X42 DSAW Pipe & API 5L steel pipe. These tubulars are used in pipeline transportation systems, which facilitate the transmission of oil and gas. API Line pipes makes the pipeline, its available in both electric resistance weld (API 5L X42 HFW Pipe / API 5L X42 ERW Pipe) or API 5L X42 seamless pipe, API 5L X42 casing and tubing. API 5L X42 DSAW Pipe are suitable for a range of line pipe applications in accordance with API 5L, and gas systems in accordance with EN 10208. We also stock API 5L MS Line Pipe, OCTG, oilfield casing, tubing, pup joints, drill collars, and associated premium tubular products and other OCTG accessories to the regional Oilfield, Oil & Gas related projects. We have a large clientile of API 5L Gr.B Pipe in oil and gas industry in more then 80 countries. API 5L X42 DSAW Pipe is a high yield seamless pipes, modified to suit offshore structural purposes. The API 5L X42 pipe is mainly used in fixed offshore structures. But can also be used in other projects. 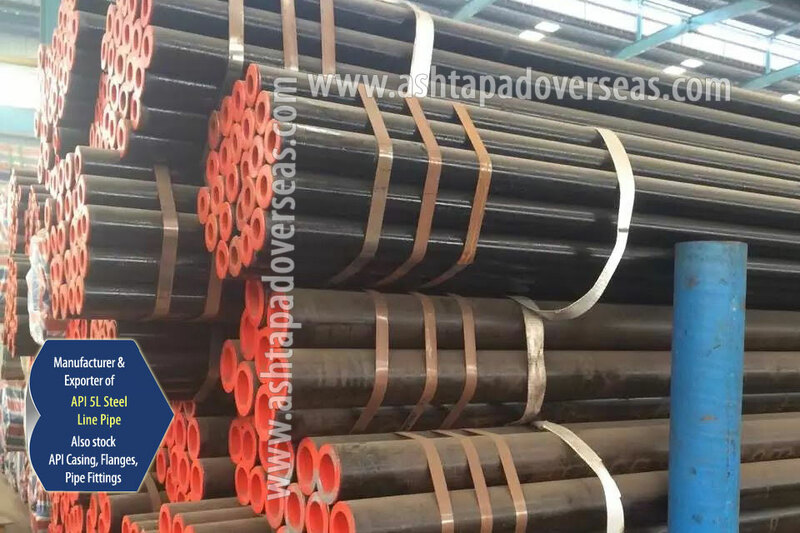 Longitudinally welded steel pipes / Carbon Steel API 5L Grade B X42 Seamless Pipe have improved ductility & used in onshore and offshore oil and gas pipelines requiring critical service, high performance and tight tolerances. Our Piping Materials for Oil & Gas Industry comes with Mill Test Certificate (MTC), EN 10204 Type 3.1 certificates & all related documents. Standards such as EN 10208, ISO 3183, ASTM A53 and AP1 5L allow either seamless or welded tubes to be used. HFI welded hot-finished tubes are generally equivalent to and designed to be interchangeable with seamless tubes or hot-finished seamless products of similar strength levels, they provide a range of additional benefits including improved ovality and wall consistency, and the opportunity to service multiple market applications. 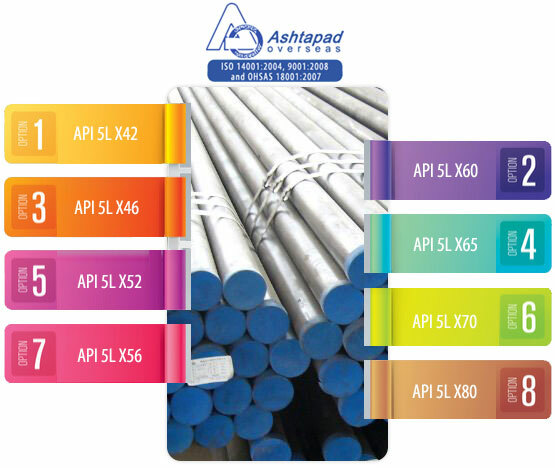 You can select any size & quantity in API 5L X42 seamless pipe to get latest price list. Before you buy API 5L X42 DSAW Pipe you must check our top 10 manufacturers price of API Steel Pipe, worldwide mill relationships enable us to offer best price in Asia. We have adequate stock of API 5L X42 DSAW Pipe, Carbon Steel Pipes, API Line Pipe, PSL1 Pipe, PSL 2 Pipe, Black Pipe with Complete Piping Solutions. The manufacturing of Double Submerged Arc Welded Pipe involves first forming steel plates into cylindrical shapes. Then the edges of the rolled plate are formed so that V-shaped grooves are formed on the interior and exterior surfaces at the location of the seam. API 5L X42 Double Submerged Arc Welded (DSAW) steel pipe is available in straight and spiral welded both forms. When it is cold expanded, DSAW pipe gains in yield strength. DSAW pipe can be specified in very large diameter and to exact inside or outside dimensions. API 5L X42 Pipes are inspected for internal and external flows by automatic non-distructive testing of ultrasonic and electromagnetic inspection. Pipe ends inspection after beveling is done by magnetic-fluoroscopic flaw detection. API 5L X42 DSAW Pipe Used for construction of long distance pipelines for combustible liquids and gases, nuclear station pipelines, heating system pipelines, general-purpose pipelines, vessels manufacturing, mechanical engineering and instrumental engineering. 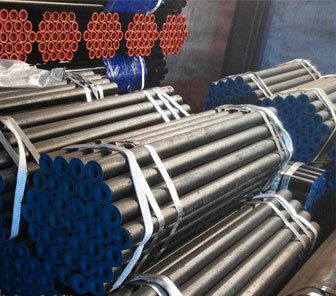 API 5L X42 DSAW Pipe Packing: Plastic plugs in both ends, Hexagonal bundles of max. 2,000kg with several steel strips, Two tags on each bundle, Wrapped in waterproof paper, PVC sleeve, and sackcloth with several steel strips, Plastic caps. We know our customers need value-added services, from threading and cutting to machining and heat-treating of API 5L X42 DSAW Pipe. So that’s what we offer. In addition, our Cut and Drop program delivers pre-cut steel marked with customers’ work order numbers, ready for machining. API 5L X42 DSAW Pipe, Line pipe, fluid pipe, water pipe, structure steel tube, piling tube, piling pipe is used in conveying gas, water, oil, and other liquefied media. We have our sub dealers of above brands with adequate stock of API 5L X42 DSAW Pipe, Tube & Tubular in India, China, Canada, Bangladesh, Taiwan, Oman, Israel, Myanmar (Burma), Zambia, South Korea, Japan, Turkey, Egypt, Vietnam, Nigeria, Indonesia, Singapore, Malaysia, Saudi Arabia, KSA , Iran, UAE, Qatar, South Africa , UK, USA, Mexico, Thailand, Kuwait, Belgium, Cyprus, Angola , Taiwan, Austria , Chile for detailed information about API Steel Pipe & quick delivery of API 5L X42 DSAW Pipe globally. Through years of experience & after supplying API 5L X42 DSAW Pipe to 600+ companies from Oil & Gas Industry, Petrochemical, Offshore & Onshore Projects, Rigs, Chemical & Fertilizer companies in more than 90 countries. With some forty branches spread throughout Europe, the Middle East, Asia, Australia and America, we ensure that materials are available anywhere in the world, customized wherever needed.